Donald Trump has a beef with people who question whether he's in the meat business, but what he peddled at a victory rally this week doesn't appear to be Trump Steaks. The trademark the Republican presidential front-runner took on Trump Steaks in August 2006 was canceled eight years later, in December 2014, according to the U.S. Patent and Trademark Office. It is not unusual for meat to be purchased wholesale and rebranded, but that did not appear to be the case with the meat presented Tuesday. In fact, some of the meat on the butcher board was still wrapped in Bush Brothers packaging. 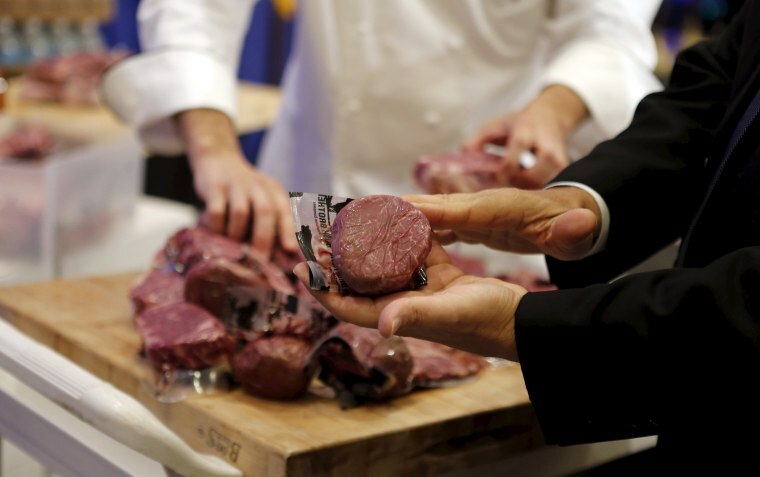 None of the meat appeared to be in Trump Steaks packaging. "We do supply his properties in Palm Beach County with beef," a company spokesman told NBC News, referring to Trump. "He's a customer." When asked if Trump was still in the meat business, his spokeswoman, Hope Hicks said in an email: "Vast amounts of meat are sold at Trump clubs and properties. Members and other patrons are allowed to purchase the meat- it is a very small, but successful business. The meat is purchased from different locationally (sic) convenient purveyors and is always of the highest quality." NBC News reached out to Hick via email Thursday specifically asking whether Trump was selling meat sold and packaged as Trump Steaks. She did not immediately return the email or a subsequent phone call. Trump on Wednesday took issue with CNN's Anderson Cooper for saying Trump Steaks was discontinued because Sharper Image, the original supplier of the meats, doesn't carry them anymore. Trump brought out the meat during his victory bash Tuesday at the Trump National Golf Club in Jupiter, Florida — several days after Mitt Romney publicly questioned the mogul's business savvy and ticked off a list of his failed ventures, including Trump Steaks. The Manhattan mogul launched his line of frozen steaks in 2007 in partnership with Sharper Image and QVC, promising to "deliver a taste of Donald Trump's luxurious lifestyle." The Classic Collection — two filet mignons, two ribeyes and a dozen burgers — were priced at $199. But while Trump can rightly claim a number of business successes, marketing meat turned out not to be one of them. "The brand aired only in 2007, but it looks like there were some online orders that came through in 2008," QVC spokeswoman Ilana McCabe said in an email. "Nothing after that."